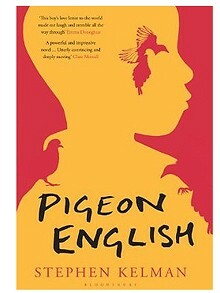 Pigeon English is seen though the eyes of an 11 year old boy recently arrived from Ghana, but it doesn’t fall into the category of young childrens’ fiction. It opens with the aftermath of a murder. The dead boy’s mama was guarding the blood. She wanted to it to stay you could tell. The rain wanted to come and wash the blood away but she wouldn’t let it. She wasn’t even crying, she was stiff and fierce like it was her job to scare the rain back into the sky. And with these few words on the very first page I'm completely hooked and completely in the head of the main character, Harri. What brilliance! Harri decides to start his own murder investigation with his friend Dean on the case. His surroundings bristle with half-understood menace, from drug dealers, alcoholics, criminals and the members of the terrifying Dell Farm Crew gang who stalk the estate and whose leader X-Fire (Crossfire) gives Harri tasks to prove himself. But Harri retains his fresh ebullience in his newfound world of high-rise flats, escalators with teeth trying to eat you, the underground, a new slang language, fights with his sister, fending off her friend Miquita who is trying her best to seduce him, the first flickering of love for a girl called Poppy and an aunt who burns off her fingerprints so that she gets to stay in the country. This is a first novel for Stephen Kelman but what a debut! Publishers were bidding for it and against strong competition he made it to the short list for the Man Booker 2011. So what makes Pigeon English such a ‘break-out’ novel? For me it all boils down to voice. Kelman has captured it perfectly – both the voice of the protagonist and his own authorial voice. And the fact that he writes so convincingly of what he knows. In the run-up to the Man Booker I heard him on a panel with the other five finalists where he told of growing up on a Council Estate. He only had to look out his window to see the gangs and the culture of crime. The novel’s name is a play on the estate's ‘pidgin’ English, a patois that Kelman captures with conviction (and has fun with too) and the feral pigeon with pink eyes that Harri comes to believe is watching over him. In 1994 I wrote a novel seen from the eyes of a boy at a time of incredible violence in the backstreets of Johannesburg South Africa, when people held kangaroo courts and necklaced victims (by putting burning tyres filled with petrol around their necks and shoulders so they couldn’t escape) and gangs mowed down people with AK-47’s. It went on to win the M-net Award with J.M. Coetzee on the shortlist. I mention it because I know how hard it is to balance a story about hope and childhood innocence against a background of harsh reality without being too dramatic or too mawkish. Kelman has found the perfect pitch. Harri balances on the edge of innocence with fresh energy and enthusiasm against the squalor of poverty, drugs and violence. One can’t help but be thoroughly charmed and moved by Harrison ‘Harri’ Opoku, aged 11. It's a wonderful read. Another book to add to my 'to read' list - thanks, Diane. Great to hear such an enthusiastic review. By the way,what was the name of your story, Dianne? Sorry Christmas got to me and I forgot to tune in to comments! I love the idea of your stories Terry with God on a bike and the Devil wearing a tribal hat. Yes I suppose we do speak pidgin in Africa... its certainly an exotic mix of Dutch, English, Malaysian and songs like 'Daar Kom die Alibama' which refers to the Confederate ship the Alabama that put into Cape Town on one of her raids and is sung in a mixture of languages and has become part of the repetoire of the Cape Carnival. My book Penny, was 'Boikie You Better Believe It'. (Boikie being slang for Dude but its direct meaning is the diminutive of boy as in 'little boy'. So pidgin English once again!! !